The BEST site for Potato Gamers like you! 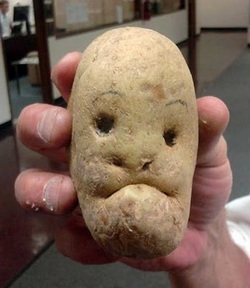 Gaming Potatoes is a Site centered to fit your needs. Our ingenious staff full of fries, tater tots, and baked potatoes are ready to serve you! Meet Alfonso. The Newly Elected Gaming Potatoes President!!!! Welcome all Potatoes, together we are an army, an army of food, of potatoes. We have French Fries, Tater tots, potato wedges, baked potatoes, and good ol' Mashed potato. we come together for one sole purpose, eating. But eating is not all that we do, that's why as your new GP president I will make sure potatoes are not UNDERMINED! we will become the potato that no potato has ever been!! Thank you. Potatoes are a Starchy food product that can be eaten many different ways, mash It Bake It, make French Fries, make Tater Tots, Make Potato Wedges, Add bacon to it, Fry it, Make Potato Chips, Roast Them, AND EAT THEM OM NOM NOM NOM NOM NOMN NOM NOMOMOMOMOMOMOMOMOOMOMOMOM!!! !